For the first time ever, Dr. Davis presents a simple "10-Day Grain Detox Plan - all the advice and a superb selection of recipes. Dr. Davis provides a simple "10-Day Grain Detox Plan." With carefully designed meal plans and delicious recipes, you'll have everything you need to fully eliminate wheat and related grains from your diet in just ten days. 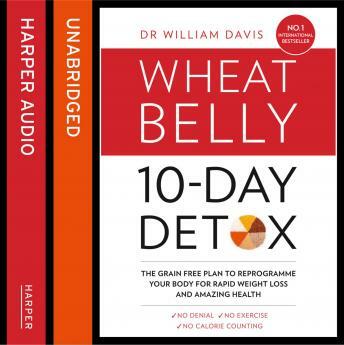 Readers will be guided through the complete detox experience and provided with instructions on how reduce or eliminate wheat-withdrawal symptoms. This plan is for people who follow Wheat Belly but may have fallen off the wagon, or for newcomers who need a quick jumpstart to weight loss. The author will conduct a test panel and follow people on their Grain Detox journey. There will be inspiring and informative case studies.